Not long ago, I read this article (FRANCIS FORD COPPOLA WINERY UNVEILS WINES TO BE POURED AT 2017 ACADEMY AWARDS® CEREMONY & GOVERNORS BALL) and it got me thinking if there exists a wine that commemorates a particular movie and could be paired with it? Pairing beer with a particular movie is quite commonplace, but commemorative wines that could be paired to a particular movie is much more rare. Here is a beer example of what I am trying to convey, but I am interested in wine only: The Hobbit Series of Beers ships this week, coming very soon. 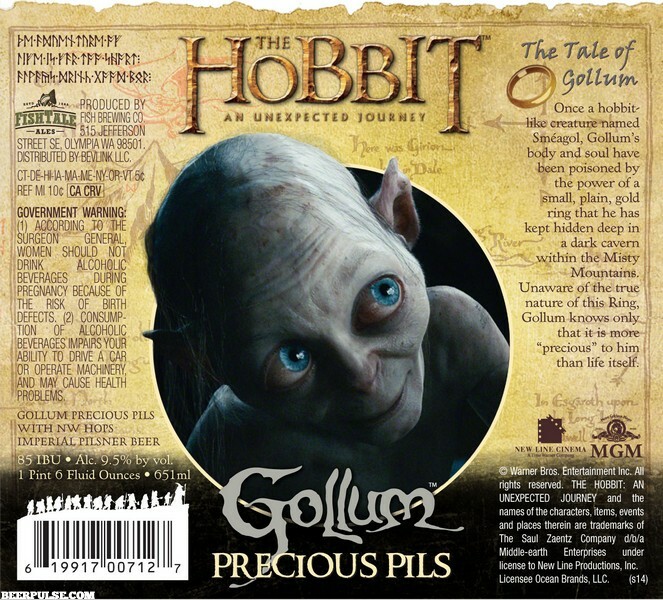 Gollum Precious Pils: A strong Imperial Pils, with flavors as smooth and crafty as Gollum himself. Like the ring which Gollum pursued for the rest of his life, his “precious” pils, if your quest leads you to it, could extend your life too! (at least we’d like to think so) It will, at a minimum, make your journey a little more enjoyable! If I am completely off the track here, tell me and I will delete my answer - but I will have a bash at this. I found some information Here, at decanter.com. There are several well-known films based on the drinking or making of wine or the wine industry itself. They range from American comedy-drama Bottle Shock (featuring Alan Rickman as wine expert Steven Spurrier), buddy-movie Sideways and book adaptation A Good Year to smaller pictures such as the controversial Mondovino, mockumentary Corked and French hit Vagabond. Individual wines have also featured on the big screen including Chateau Margaux in Withnail & I and Sherlock Holmes, Chateau Latour in Monty Python’s Meaning of Life, Chateau Angelus in James Bond Casino Royale and Veuve Clicquot in Casablanca. In May 2012 it was announced The Billionaire’s Vinegar is to be turned into a motion picture starring Brad Pitt. Wine and movie pairing, although not a very popular item these days, some people seem to be into it. Here are a few examples, for what they are worth. Silence of the Lambs (1991) can be paired with Chianti and Suit Yourself Pinot Grigio. Alamo Drafthouse is releasing two wines that pay tribute to the classic killer chiller: Cannibal Chianti and Suit Yourself Pinot Grigio. One must admit that Hannibal Lecter is one sick dude. Frankenstein (1931) or any Frankenstein movie may be paired with Francis Coppola Director’s Frankenstein Cabernet Sauvignon 2014 California. If you are a Cleopatra fan you may try a blend of Zinfandel and Pinot Noir called Cleopatra 2014 California. “On Her Majesty’s Secret Service”: This is the first of two 007 movies in which the spy truly falls in love, so let’s go with something romantic, pink bubbles: the very-berry-ish, refined Schramsberg Brut Rosé. “Diamonds Are Forever”: My favorite Bond wine moment ever is when he uses two assassins’ ignorance about Bordeaux to out and wipe out the dastardly duo. So the tippling tout is the earthy but elegant Chateau D’Argadens Bordeaux Superiore. Goldfinger”: For me (and countless others), this is the perfect Bond film: nonpareil villain, thug and “Bond girls.” So we need a near-perfect wine; let’s splurge and go with the always-stellar Chateau de Beaucastel Châteauneuf-du-Pape. - What wine goes with each James Bond movie? 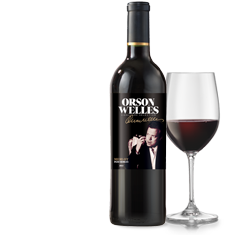 One is able to see more wine and movie parings here with such titles as the West Side Story or movies of Alfred Hitchcock or Orson Wells and many more. What liqueurs can be paired with a particular movie?